Looking ahead to the season of spring we often think upon those first precious days of warming sunlight that hold the promise of rebirth. As we notice the softening ground ready to burst forth in green we are somehow uplifted in anticipation for what is to come. Our 2018 spring issue of American Country Magazine will bring you through three distinctly different homes. Through a decorating style that is purely primitive, ?Ann and Mickey Epeards successfully transformed a new dwelling into an inviting home of the past. The charming Tennessee home of Bridgett and Ricky Swindle highlights a homeowner's passion for country decorating and a return to the antiques she grew up with as a child. Influenced by visits to Old Sturbridge Village, libraries and old houses they loved, Patricia and Richard Ram designed a Massachusetts home of practicality in which to create the look of a much earlier time. Tending to the details of the home was a labor of love and decisions were made based on careful research and a reliance on personal instinct. The result is a new home characteristic of the Pilgrim century appointed with authentic antiques of the period. 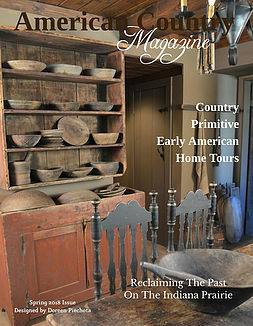 American Country Magazine hopes to continue to inspire you to create the essence of the past in your own home. And as you happily decorate and prepare for longer, warmer days, embrace the special promise that only the season of spring has to offer. Billy Jacobs Framed Artwork "Warm Spring Day"